Upper East Side Archives - Adventure, baby! 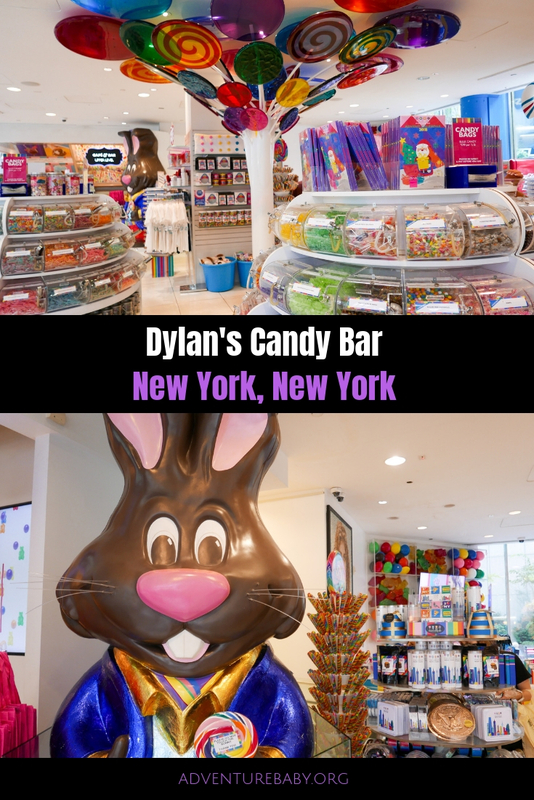 In a city as huge as NYC, it’s easy to find food to suit every dietary requirement. Delicious organic food is only a hop, skip and a Google away in most parts of the big city. As a major foodie (and vegetarian!) I’m all over restaurants and cafes where I can get fresh, locally-produced food to nourish my greens-craving body and introduce my toddler to healthy and delicious cuisine (Kale is delicious! Promise!). 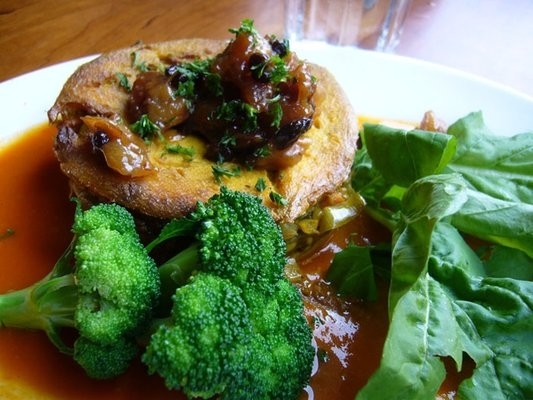 Serving organic, plant-based food, Angelica is an East Village neighbourhood fave. They serve only top quality, organic fruits and vegetables (often served to diners less than 48 hours after being harvested). Note: Angelica Kitchen is vegan, and in addition to serving no meat, eggs, dairy or animal products, they also use no refined sugars or preservatives. 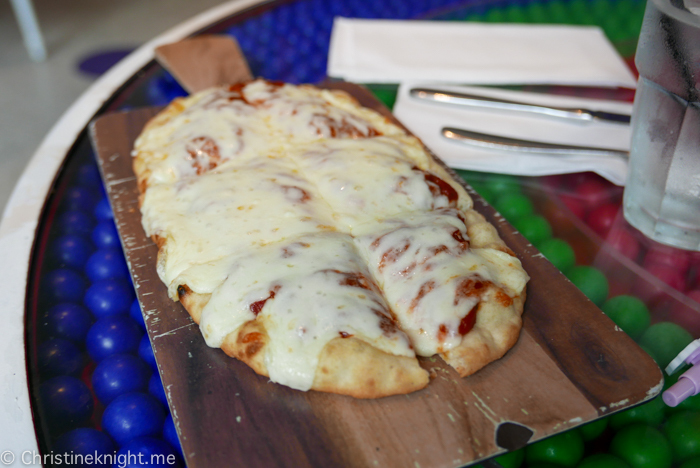 Be sure to try their Southern Style Cornbread ($3.75), which Yelpers have written odes to. 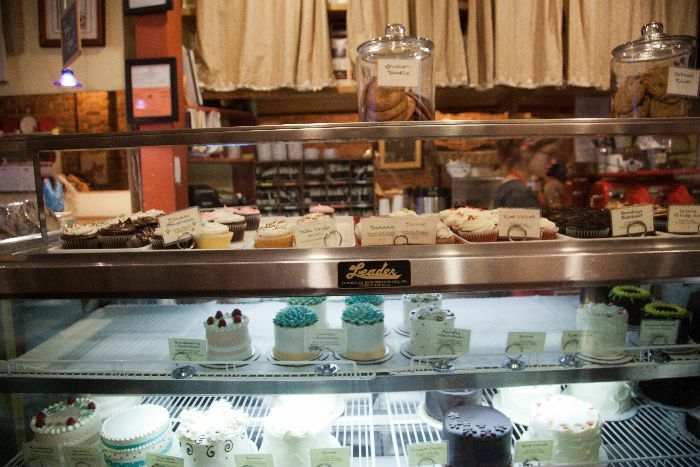 Gluten-intolerant diners are also well catered for at Angelica’s. No reservations, cash only. Bring kids on weekends – just be prepared to squish in, it’s tight quarters inside! 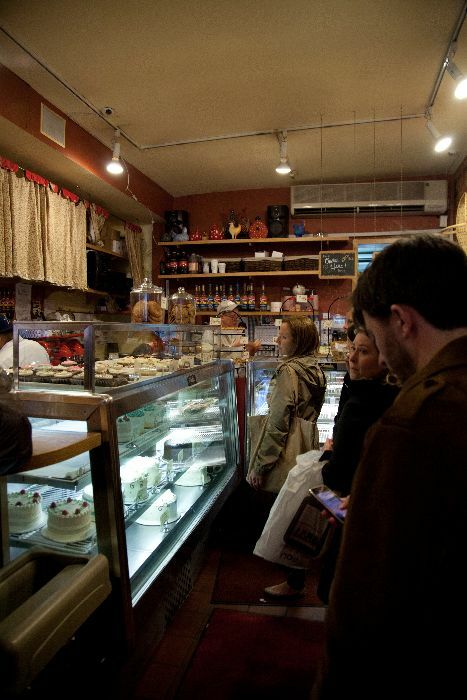 The Blossom empire includes Blossom in Chelsea, Cafe Blossom on the UWS and West Village; V-Note, an organic wine bar and vegan bistro; Blossom Bakery in Chelsea; and Blossom Du Jour, open in three locations (67th st, Chelsea and Midtown West). 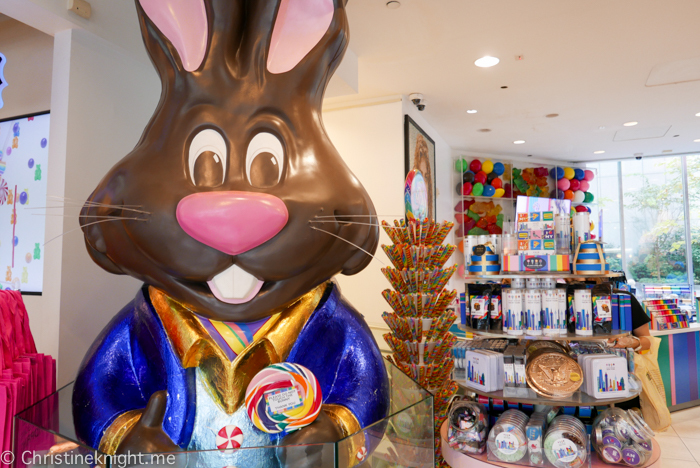 My personal favorite is Cafe Blossom in the West Village, where I like to go for special occasions like Mother’s Day or a date lunch with my husband. Their fresh ingredients come from local farms and small distribution companies, and every dish is free of animal products. My favorite dishes are the Salt and Pepper Garlic Fries ($6, they keep the toddler happy), Fried Cashew Cheese Dumplings ($11), and the Avocado BLT with smoked tofu, sunflower sprouts, mayo, cashew cheese on toasted whole grain bread ($13). 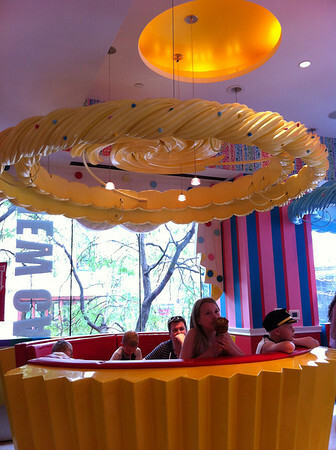 As an added bonus, they’re super kid-friendly – kind staff help diners with families feel right at home. 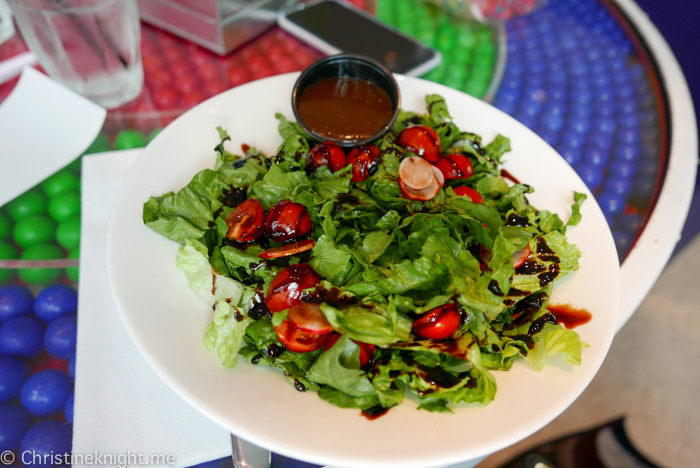 This salad transplant from DC recently opened in the NoMad Hotel. It’s the hotspot for local business folks to hit up during their lunch break, so if you go during the week expect a long line (which moves pretty quickly). 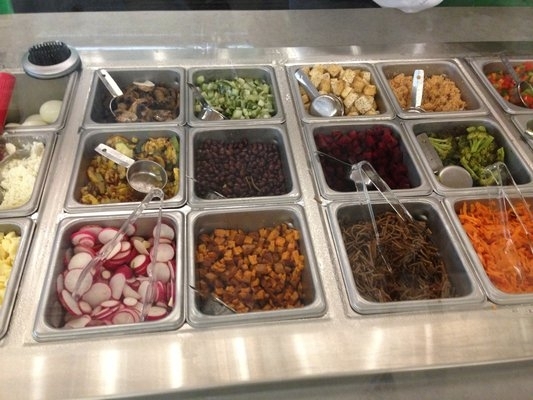 Sweetgreen is all about salads made with with local and organic ingredients. Choose a seasonal monthly special (September’s salad is organic arugula, shredded kale with local watermelon, heirloom tomatoes, cucumbers, organic mint, local feta, spicy sunflower seeds, champagne vinaigrette) or build-your-own (choose from bases like shredded kale or warm grains). With your kid? Go on a weekend to avoid the queues, and take your salad to nearby Madison Square park to let the kids run around while you enjoy your sweet Sweetgreen salad. 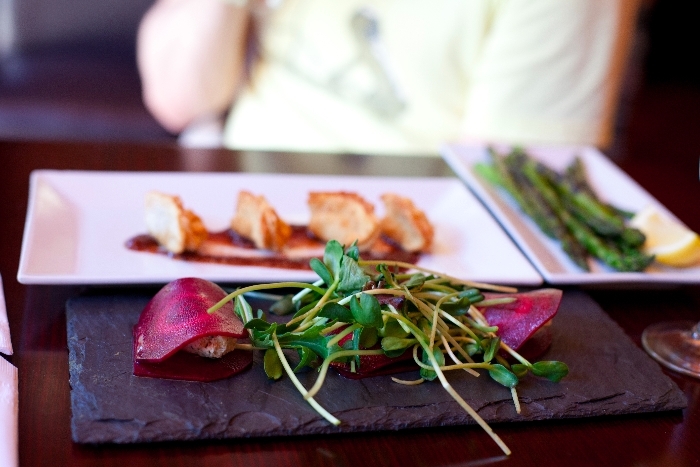 The quiet, elegant atmosphere is perfect for a romantic date night. 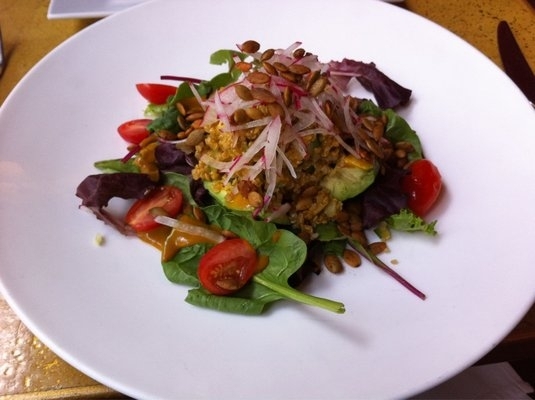 Diners enjoy vegan, seasonal and organic cuisine. Everything served is free of pesticides, chemicals, and hormones, and doesn’t include any genetically modified foods. Try the Live Stuffed Zucchini Blossoms ($24, with broccoli, cauliflower, corn, crunchy sprouts, cashew vegetable cheese, avocado sauce, pico de gallo) or the chef’s daily hand-cut pasta. Candle 79 is also a great place to take the family for a special early dinner out. The staff are friendly and accommodating to children. 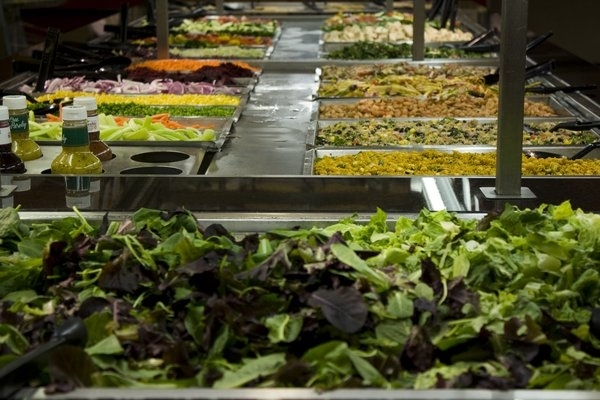 As well as being a super-expensive supermarket that stocks produce and ingredients for every possible dietary requirement, Whole Foods also has an amazing selection of prepared foods and a salad bar to die for. All ingredients are natural or organic and as many as possible are locally grown. This means no artificial flavors, colors, sweeteners, preservatives or trans fats. I love to grab a salad from Whole Foods in the Time Warner building at Columbus Circle and take it to sit in Central Park for a delicious, reasonably-priced lunch. Whole Foods is an especially good respite when you’re out with kids. Great food and a casual dining area make for an easy, tasty place to eat, without the stress of going to a fancier restaurant. This ice cream chain out of Boston specialises in wacky flavors, and are the originators of the “flavored cone” (think waffle cone covered in Fruit Loops, Fruit Pebbles or Oreos). 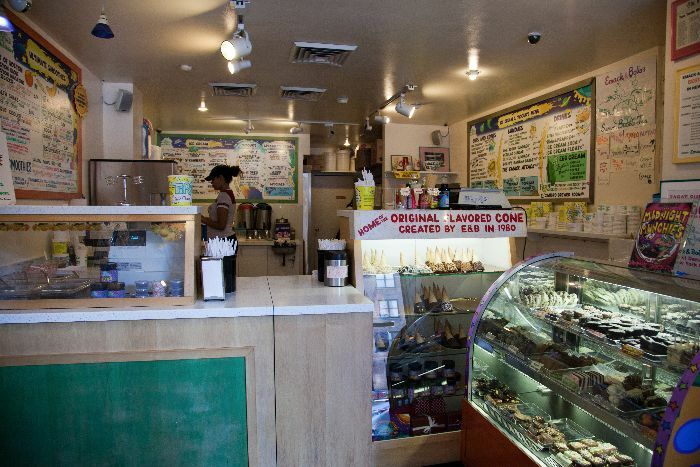 I’m a huge fan of ice cream with big chunks of goodies in it, which is why, after reading a review describing them as similar to my long-time love Ben & Jerry’s, I badly wanted to check them out. The flavors (they boast 100 per year) are indeed wacky. 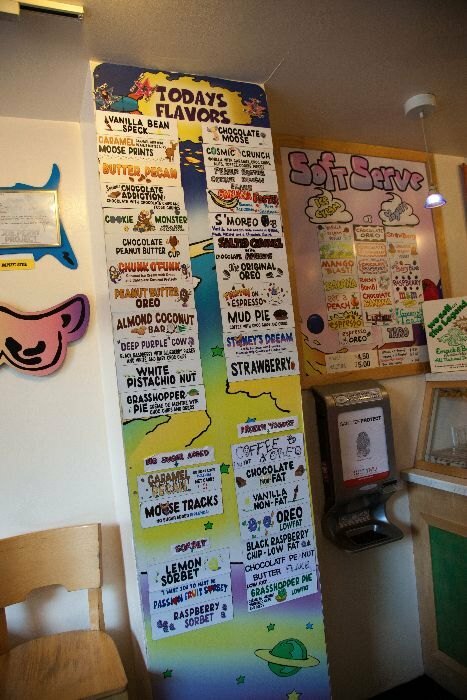 Flavors on the menu include “Caramel Moose Prints” (I’m guessing caramel … and moose?) and “Cosmic Crunch” (vanilla with caramel, choc chips, nuts, toffee, cookies pieces). The staff were super friendly and happy to hand out as many samples as I wanted to try. I sampled “Purple Cow” (black raspberry with white and dark choc chips). 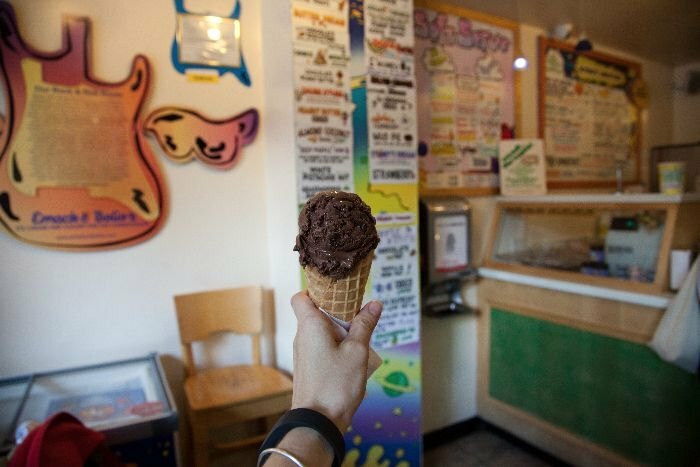 It was delicious, but I was in the mood for something a bit more chocolatey, so I settled on “Serious Chocolate Addiction” (chocolate with chocolate chips and fudge chunks — single scoop, $4.25). I was told that these are two of their most popular flavors, and I can certainly see why. 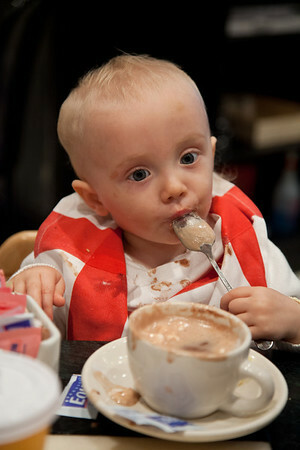 The chocolate ice cream had lots of big chunks of other chocolate goodies, swirled in a rich, delicious ice cream base. 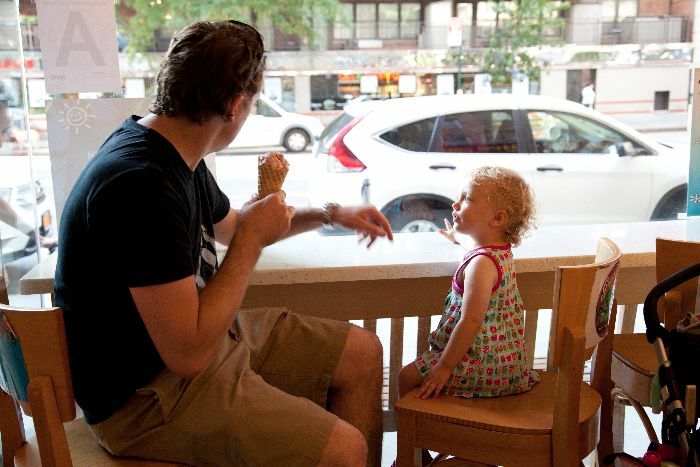 We sat on stools and people-watched while we enjoyed our ice creams. Note: there are only bar stools at the window to sit on. No chairs and tables indoors. You can, however, sit outside on the bench with your stroller parked in front of you. 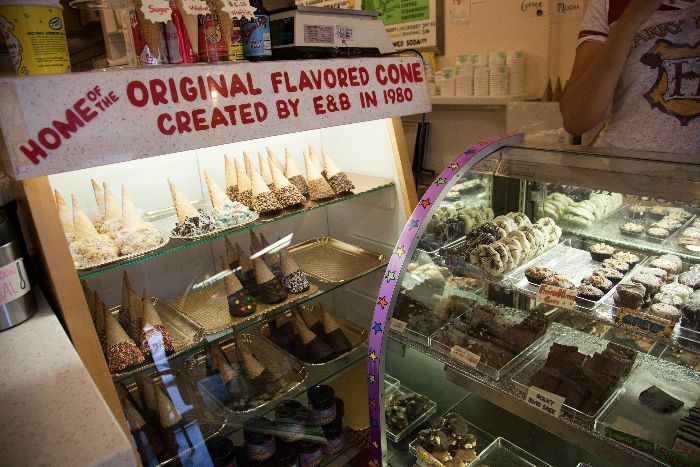 Last bite: A fun place to stop for some seriously funky ice cream. 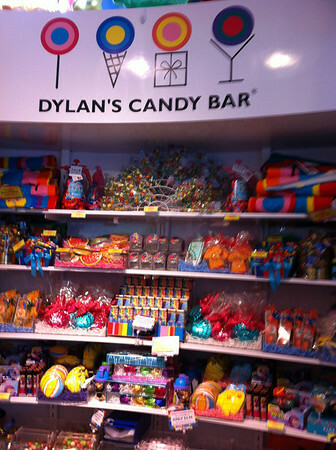 Delicious treats for adults and kids alike. Cupcakes and cakes on display. 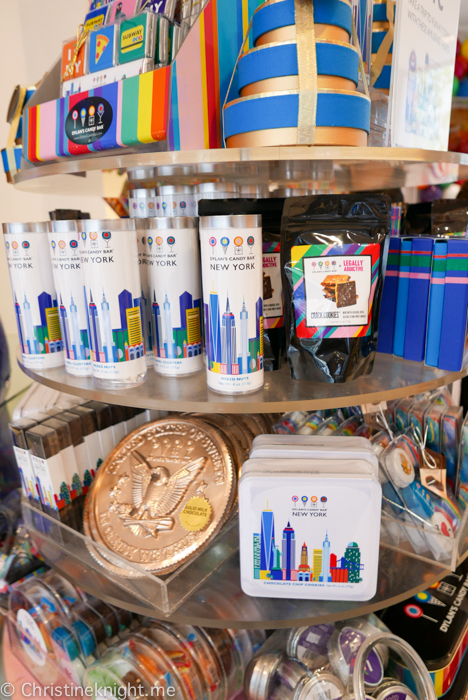 A little cupcakery on the Upper East Side, Two Little Red Hens is big on great-tasting treats. 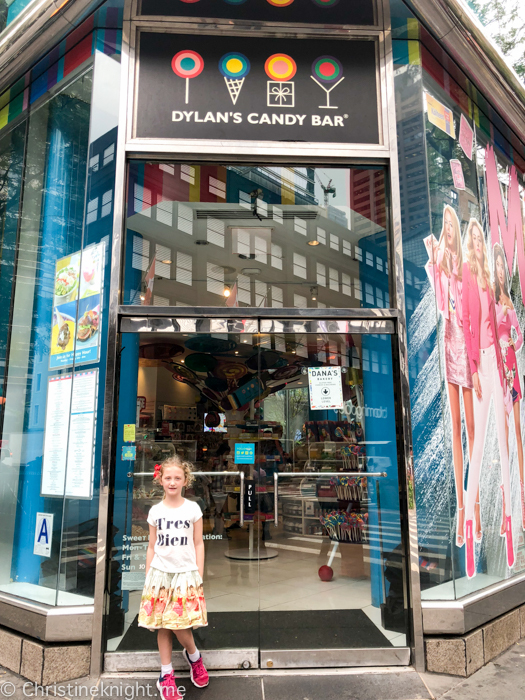 We dropped by after a day in nearby Central Park for a sugar hit to get us home. 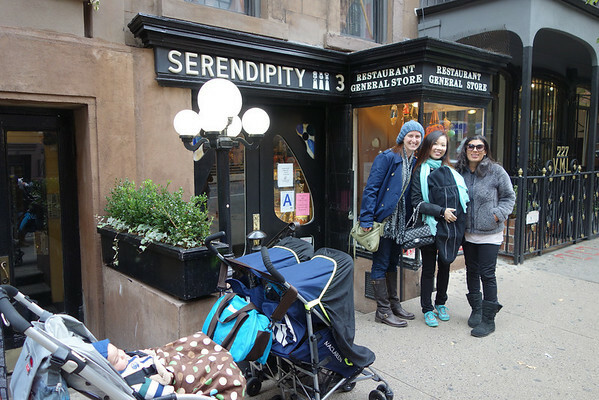 It’s a tiny little storefront, but still has room for a few strollers. Famous for their red velvet. Two Little Red Hens is known for their red velvet cupcakes. 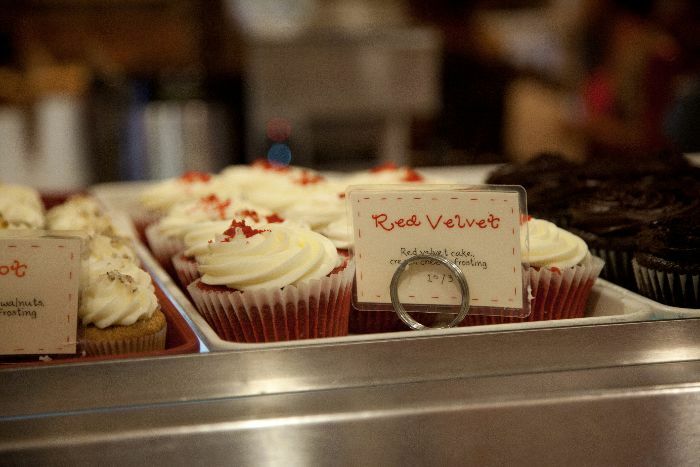 People (yes, sane ones) trek to their bakery from all over the city just for these cupcakes. A little dining area, with room for strollers. If you don’t like cake, this is not the place for you. 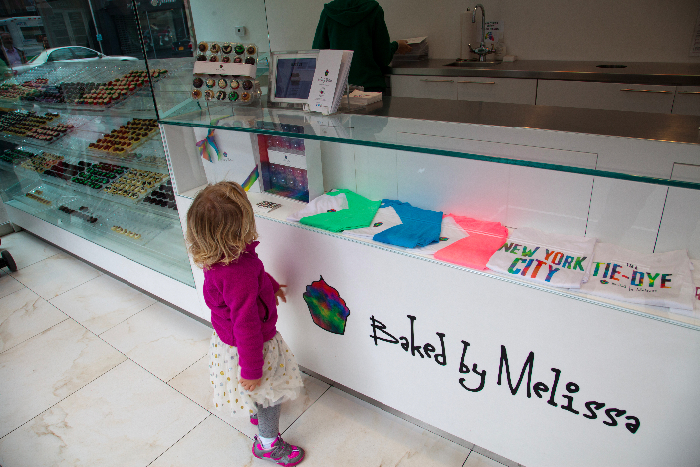 Note the display – cake, cake, and more cake. And some cookies for good measure. The cupcakes are available in regular and mini sizes, perfect for a small bite of cake if that’s all you feel like. Crowded area to buy the cupcakes. On the afternoon we visited, there was a queue for the cupcakes, but the wait wasn’t long. 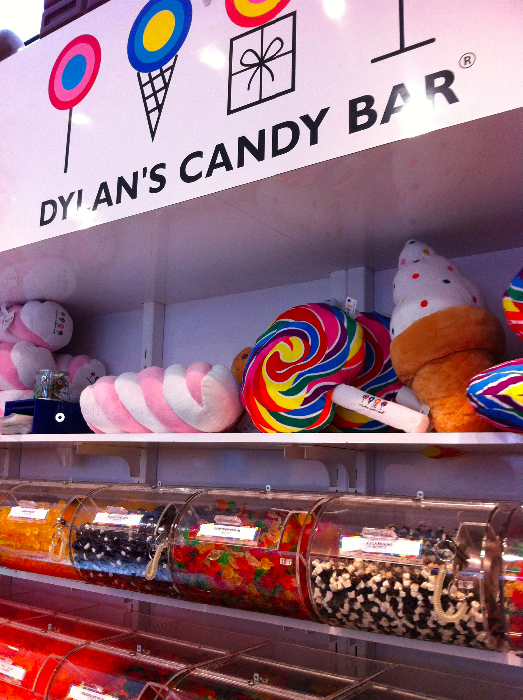 It is a small space though, so be prepared to squish in – and eat lots of cake! 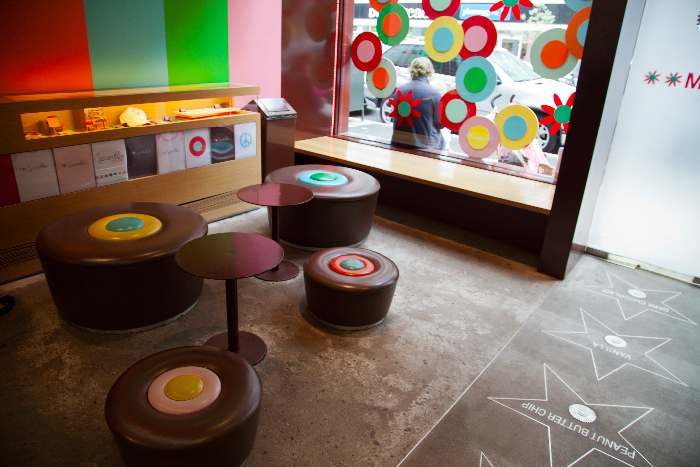 Last bite: Cupcakes galore, with just enough room to sit down with the kids for an afternoon (or morning!) treat. E.A.T. 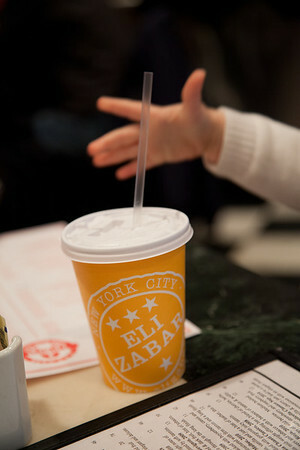 was opened by Eli Zabar in 1973. It was the first of Eli’s shops, filled with his ideas on what makes for great food – delicious bread, overstuffed sandwiches and salads made in small batches several times a day. E.A.T. 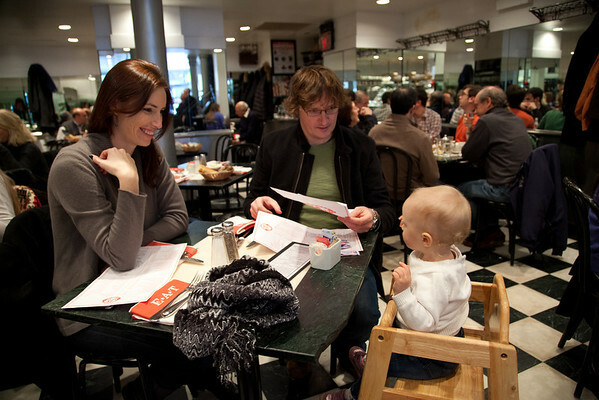 is a great cafe to stop by on the way to or from the Met, particularly if you have your infant or toddler in tow. The cafe has lots of tables and space – we were sat immediately during a busy Sunday lunch period. Right after being seated, water arrived – in a bottle for us, and in a cute little cup with a straw for the toddler. The service continued to be attentive and fast. A bread basket with three kinds of bread and butter quickly appeared (their tagline is “Everything comes with Eli’s Bread!”), and our meals arrived with astonishing speed. 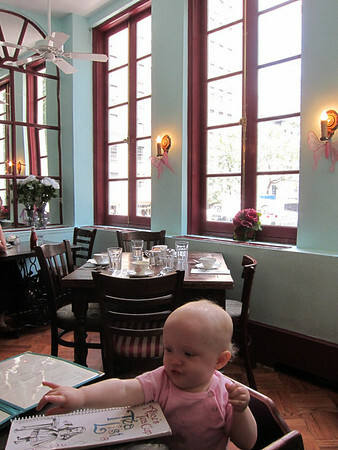 Dining was a bit pricey (a cheese omelette was $20), but hey, it is the UES after all, and it’s worth paying a bit extra to have an enjoyable dining experience with babies and toddlers. The straw cup for our littlest diner went down well. Cheese captures and destroys a (cooled) hot chocolate. Stroller storage: Yes – but minimal. We folded ours next to the table and it was no problem. Take an umbrella stroller or baby carrier if possible. 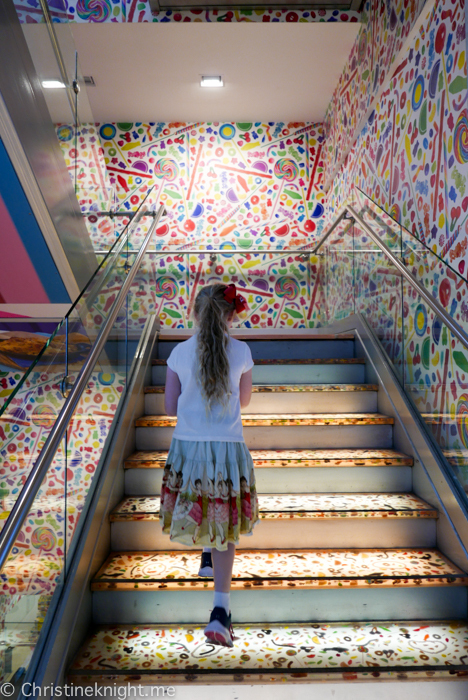 Easy access: Yes – one step to get in, and then navigate through the take away shop before getting to the entrance to the restaurant. Change tables: No. The bathrooms are tiny (also a bit gross) – no room to even change a baby on the floor. 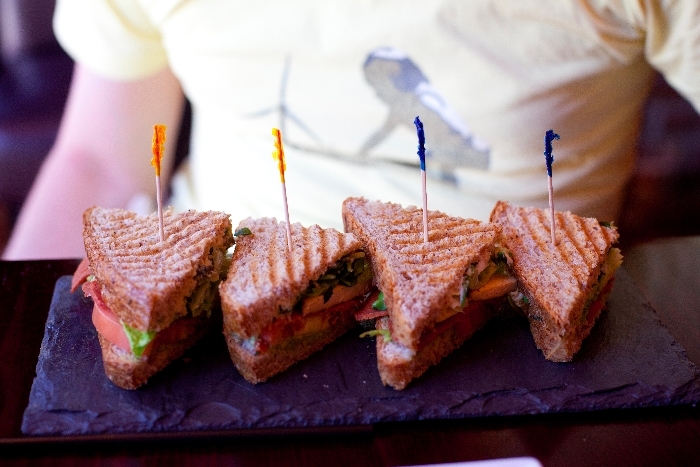 Via Quadronno is famous for their mouth-wateringly amazing paninis. Also gasp-inducing? The prices. Two paninis, a latte and a croissant will set you back around $40. Note to pastry lovers: They have Payard’s croissants here! The perfect, buttery pastries are worth the exorbitant prices. Describing this restaurant as tight-quarters is an understatement. Our suggestion is to order takeaway at the front counter and eat your delicious panini either on the bench out the front of the restaurant, or take a short walk to nearby Central Park for lunch with a view. Sheltering from the rain with lunch at Via Quadronno. 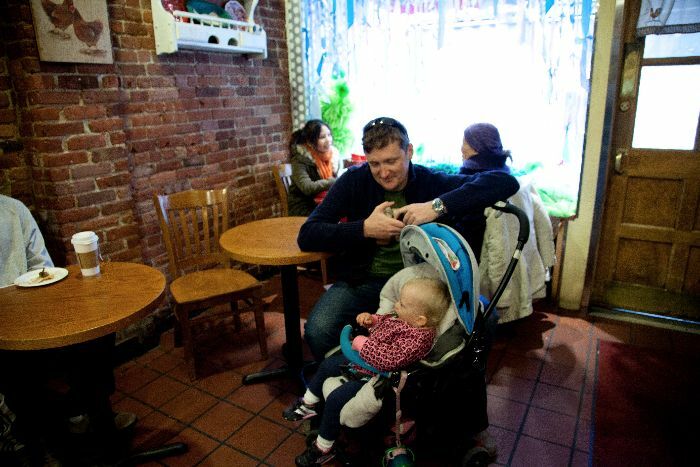 Stroller storage: No – this is a tiny cafe. Bring a carrier if possible if you’re planning to eat inside. Easy access: Yes – one step. There are more stairs however into the main dining area in the rear. 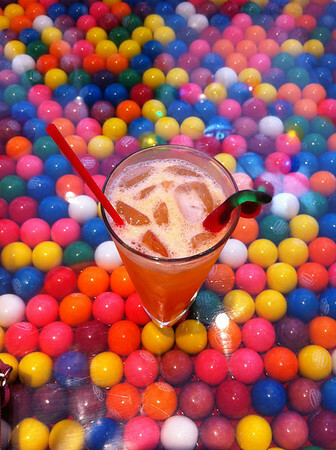 While kids and teenagers on the ground floor whirl around the self-serve candy bar, minutes away from a sugar coma, upstairs is a bright, pastel haven where you and your little ones can sit in giant life-sized cupcake booths (excellent privacy for nursing mothers) and chug down sweet candy-themed cocktails from the bar. Savoury food is limited to pizza and build-your-own deluxe peanut butter and jelly sandwiches (add-ins include things like rice krispie treats, so this isn’t your typical sandwich). 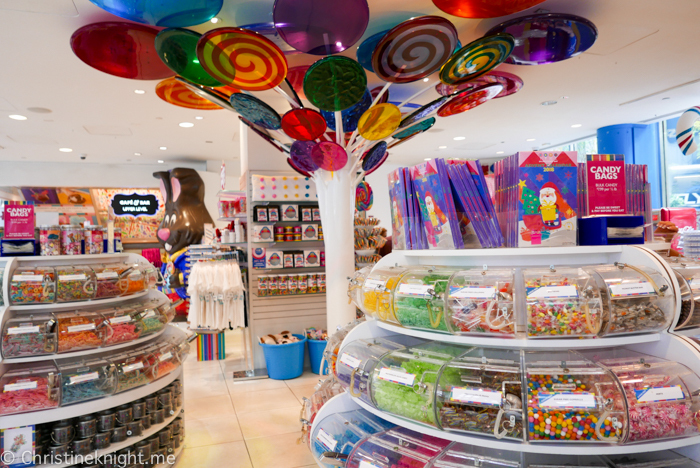 Their speciality is, of course, desserts, so be prepared for a sugar-high pretty much as soon as you walk in the door. Cocktail + sugar = bliss. 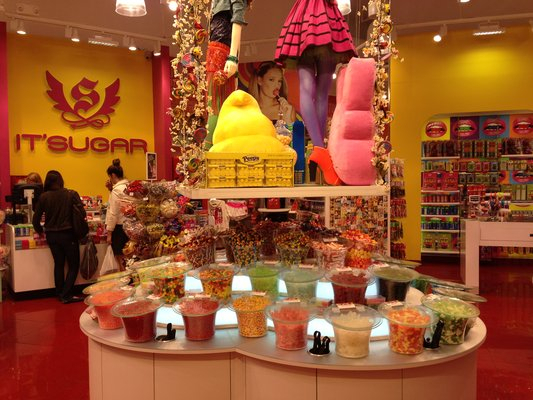 Too much sugar for everyone. 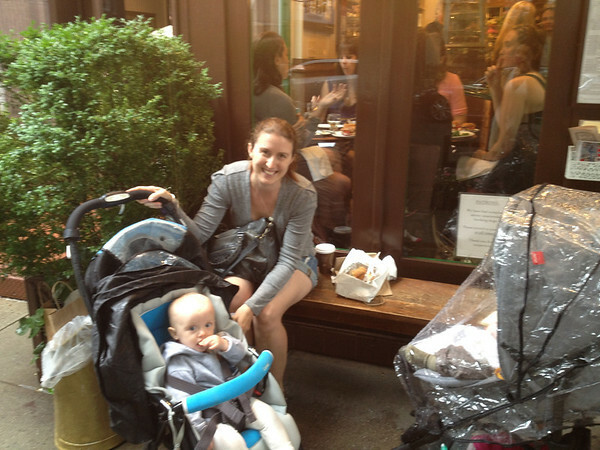 Stroller storage: No – but there is plenty of room for strollers to wheel around or sit at your table with you. Easy access: Yes – an elevator to the 2nd floor where the cafe is housed. 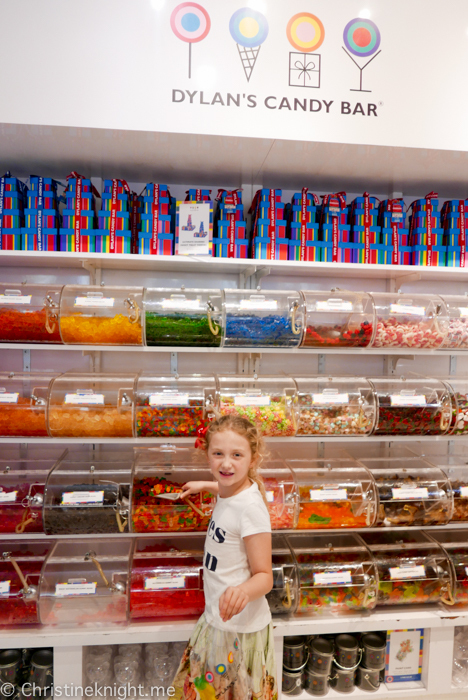 Kids’ menu: No – but most older kids will eat pretty much anything on the menu. Ice-cream – hello? A place this cute and kitschy screams child-friendly – until you read the sign on the door that reads “Absolutely no strollers or carriages allowed in the restaurant”. 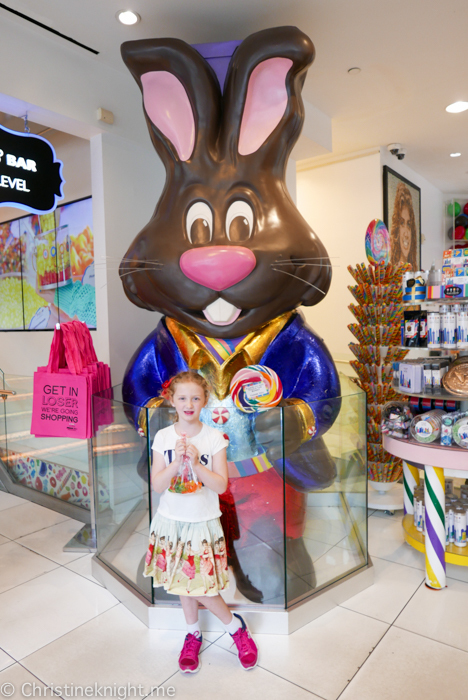 The decor, with oversized clocks and stained glass lamps, is a vision out of Wonderland – but this land is for big kids, not toddlers and babies. When asked if they have highchairs, the server responds with a no – adding they have booster chairs however, which they don’t recommend we use because they’re not safe. Having a heart-to-heart with a friend’s toddler, who is perched on the “un-safe” booster seats. 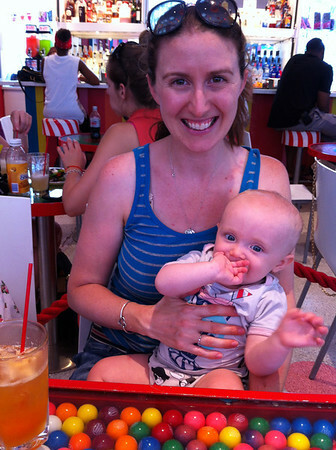 The tables are small and squished together, making it difficult to hold infants on your lap. Add to that slow service and a potential long wait for a table (half an hour on weekdays, up to an hour on weekends), and you’ve got a place that is best left till the kids are a lot older. 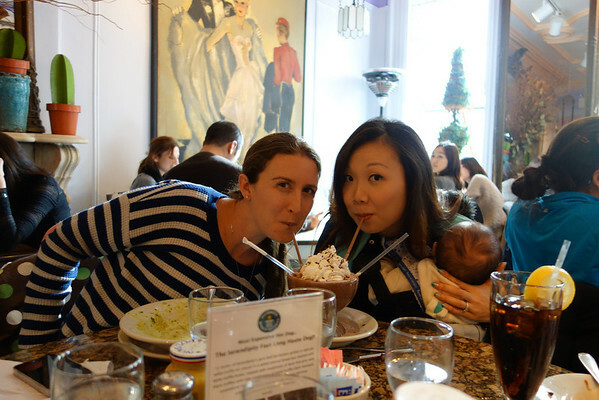 The redeeming feature of Serendipity 3 is that their meals are tasty and large portioned, including their speciality Frrrozen Hot Chocolate, which is large enough for four people to share. Three ladies, three babies. Stealth baby in the baby carrier. Forbidden strollers ready to be deployed. Easy access: No – several stairs down into the restaurant, plus two flights of steep stairs if your table is in the upstairs section. 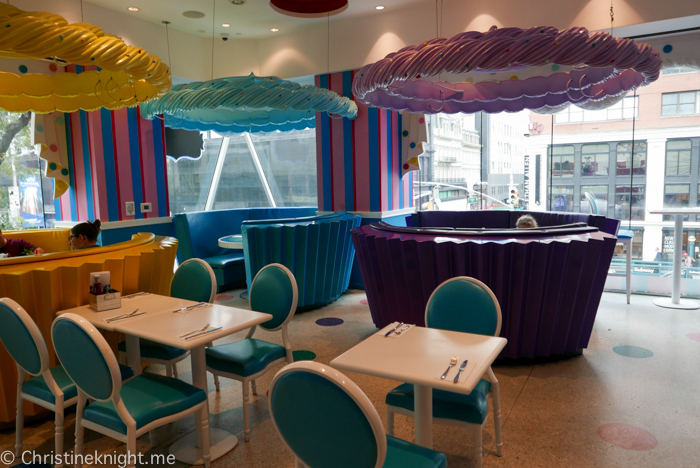 Serendipity 3 accepts a limited amount of reservations for lunch and dinner only, not for desserts. To make a reservation for lunch or dinner please call (212) 838 3531. 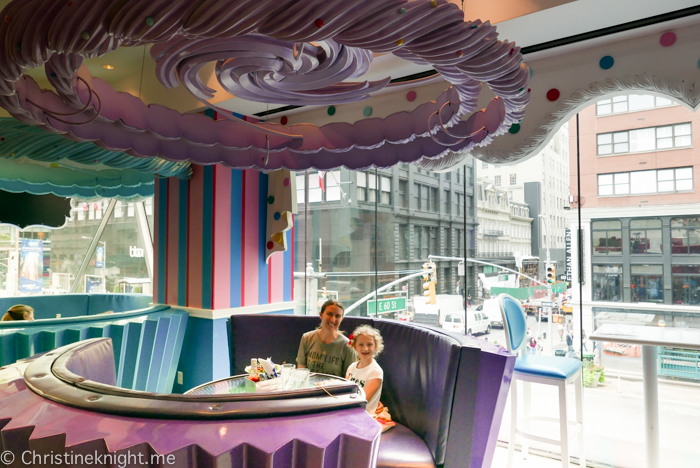 A little girl’s dream come true, this cafe chain is heaven for kids and adults alike. 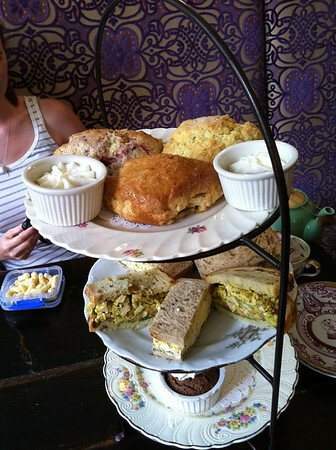 Delightful scones, a large menu of tea and whimsical decor make this a fun place to eat. 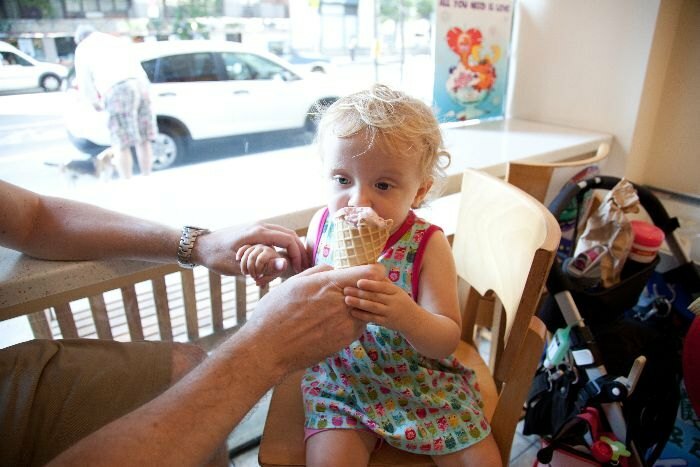 While it’s definitely kid-friendly, it’s not so great for young toddlers and babies. On weekends there is a long wait (usually an hour), no reservations, and slow service. 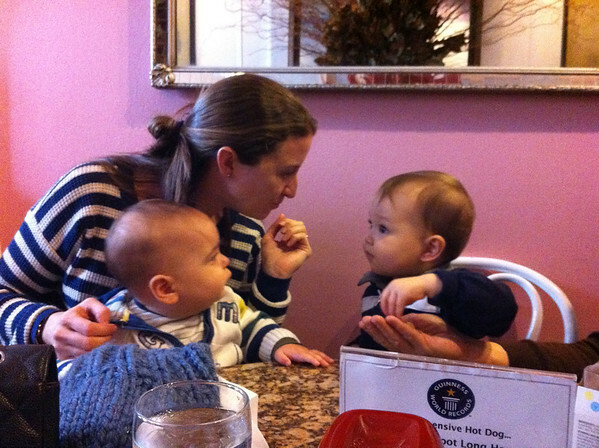 Highchairs: Yes – a limited amount however. We were told during one visit that if wanted a table with a high chair it would be an additional wait time. Stroller storage: Limited space. Bring a stroller that folds up if possible. Easy access: No – lots of steps.